The first women's professional soccer league in the U.S. formed after the success of the 1999 Women's World Cup. 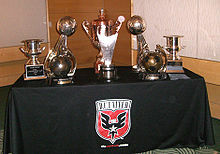 The Women's United Soccer Association (WUSA) ran from 2001–2003 and featured many of the World Cup stars, including Mia Hamm, Michelle Akers and Brandi Chastain. Its successor Women's Professional Soccer (WPS) ran from 2009–2012. Currently, the National Women's Soccer League (NWSL) is the top professional league in the country and was formed in 2012. The NWSL season runs from spring to early fall (typically April – October). In 2017, A&E Networks bought an equity stake in the league and broadcasts a game of the week on Lifetime, and formerly streamed all games online via the go90 platform. During the 2018 season, the NWSL moved some of the games originally scheduled to air on Lifetime to evening slots on ESPNews (both channels being part of the Disney family), and when go90 owner Verizon shut down that platform at the end of July, the NWSL streamed the games that were intended for go90 on its own website. U.S. men's national soccer team at the 1930 FIFA World Cup. Pelé crying while teammate Carlos Alberto consoles him, at the end of his speech during Pelé's farewell match, October 1977 (New York Cosmos). Major League Soccer (MLS) is the professional first-division league in the United States. It currently has 24 teams — 21 in the U.S. and 3 in Canada, with further plans to expand to 28 teams by 2022 and 30 teams at a later date. With careful cost controls and the construction of soccer-specific stadiums, some MLS clubs became profitable for the first time in the mid-2000s, and Forbes magazine found that three clubs were already valued at $40 million or more, with the Los Angeles Galaxy worth $100 million. The establishment of the Designated Player Rule in 2007 has led to the signings of international superstars such as David Beckham and Thierry Henry, and Cuauhtémoc Blanco. Major League Soccer has been in an expansion phase, going from 10 teams in 2005 to 24 teams today, with plans to expand to 26 in 2020 and at least 27 in 2021, with further plans to expand to 28 teams by 2022 and 30 teams at a later date. The league's 2007 and 2009 expansion to Toronto and Seattle, respectively, have proven highly successful, with league-leading ticket and merchandise sales, capped by sold-out attendances for friendlies against Real Madrid of Spain and Chelsea of England. In 2013, New York City FC agreed to pay a record $100 million expansion fee for the right to join MLS in 2015. This record was surpassed by the ownership groups of FC Cincinnati and a new Nashville team, which each paid $150 million to join MLS (FC Cincinnati in 2019 and Nashville in 2020). [a] The same amount was paid as an effective entrance fee by a group that bought Columbus Crew SC in 2018, which led to that team's previous operator receiving a new team in Austin, Texas that will join MLS in 2021. The league plans to expand to 27 teams with the addition of Inter Miami CF and Nashville SC in 2020 and Austin FC in 2021, with further plans to expand to 28 teams by 2022 and 30 teams at a later date. MLS has also announced the ownership groups of the 28th and 29th teams will each pay a $200 million entrance fee. MLS average attendance has been steadily growing, from 13,756 in 2000 to 22,113 in 2017. MLS has drawn a higher per-game attendance than NBA basketball and NHL hockey every year since 2011. With an average attendance of over 20,000 per game, MLS has the third highest average attendance of any sports league in the U.S. after the National Football League (NFL) and Major League Baseball (MLB), and is the seventh highest attended professional soccer league worldwide. Professional soccer has been less popular in the United States than most other parts of the world. Although MLS is also much younger than most other countries' first divisions, it is already the twelfth most-attended premier division in the world. MLS has announced its goal of developing into one of the top soccer leagues in the world by 2022. Following the USL–NASL feud and a subsequent tightening of U.S. Soccer standards for owners of second-division teams, the USL folded its First and Second Divisions into a new third-level league originally known as USL Pro, later as the United Soccer League, and now as the USL Championship. The league launched in 2011 with 15 teams–11 on the U.S. mainland, three in Puerto Rico, and one in Antigua and Barbuda—but due to issues with the health and finances of two of the Puerto Rican owners, the Puerto Rican teams were dropped from the league shortly after the beginning of its first season. One of the U.S.-based teams folded following the 2011 season; two new U.S.-based teams joined the league in 2013. In that same year, MLS and USL Pro entered into a formal agreement that eventually merged the MLS Reserve League into the USL Pro structure. Each MLS team is nominally required to field a reserve team in a USL league, either by operating a standalone team or affiliating with an independently owned team, though this has yet to be strictly enforced. After the 2013 season, the Antigua and Barbuda team folded, as well as one U.S.-based team. In addition, one U.S.-based team left the league but was replaced by a new team in the same area; and three completely new teams entered the league for 2014. One of the new teams was an MLS reserve side. ^ Cite error: The named reference forbes.com was invoked but never defined (see the help page). ^ Cite error: The named reference forbes-2015-08 was invoked but never defined (see the help page).